‘Tis the season for holiday parties and gatherings. One after another, now through New Year’s, you’ll be having your fill of cookies, fruitcake and finger foods. This season, if you plan to host a holiday party, raise the bar – the hot chocolate bar. Here’s your guide to the ultimate crowd pleaser for both adults and kids. Hot chocolate is the little black dress of the season – you can’t go wrong drinking it, even if you live where winters are mild. Warm and reminiscent, it recalls memories of staying in pajamas all day, football concession lines, and Humphry Bogart movie nights. It can be enjoyed in sweet simplicity or with all the bells and whistles winter calls for. Either way, let your party be a celebration of this chocolate elixir’s many variations. Let’s get started! 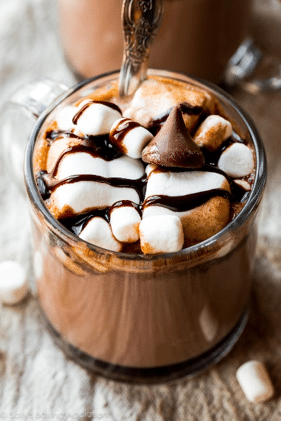 The Main Attraction – We won’t tell you how to make your hot chocolate, but we will say go above and beyond opening a packet of powder and stirring in hot water. Consider featuring a few of these recipes, such as a Mexican Hot Chocolate or an adult Bailey’s blend, to satisfy various palates. And if “Shortcut Sally” is your middle name, snag a recipe that uses a slow cooker, whisk in the ingredients and keep it simmering on low while you set up the rest of the party. 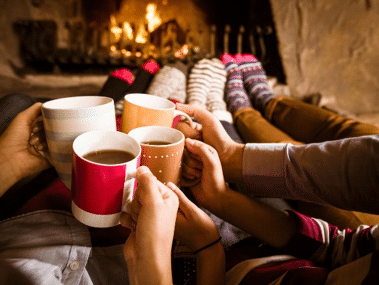 The Vessel – If you have a collection of mugs– matching or not – roll ‘em out and line ‘em up; it’s hot chocolate time! Don’t have a plethora of mugs? Serve it up Starbucks style; use paper coffee cups complete with sleeves and lids. *Bonus points for customizing your sleeves for your party. The Toppings – Here’s where your creativity can shine! Have fun with the toppings and let your kids help. Some of our favorites include: marshmallows, crushed candy canes, toffee bits, mini chocolate chips, whipped topping, caramel and chocolate syrup, peanuts, coarse sea salt, shortbread cookie pieces, Pirouette cookies, cinnamon-sugar, and toasted coconut shavings. *Pro tip: drop a Lindt truffle into your mug of hot chocolate, stir until melted, and thank us later. Displays & Décor – Take advantage of the elegance of South Carolina’s greenery. Southern magnolia leaves, cedar, holly and pine make festive accents to your table and pay tribute to your natural, rustic surroundings here at Saluda River Club. Glass bowls can display topping selections, while glass canisters can house spoons, straws and stir-sticks. A chalkboard menu will tie the theme together. Party Favors – Let your guests take a piece of the party with them. 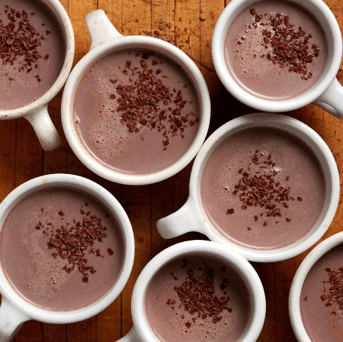 Tie a bag of truffles with your favorite hot chocolate recipe attached. Hand out travel mugs for hot cocoa on the go. Order customized coasters for a memory that is both stylish and functional. Make mason jar hot chocolate kits so guests can recreate the fun in their own homes. Or simply hand out candy canes! Favor or none, your party will be one to remember!